Bethenny Frankel’s Ex-Boyfriend, Dennis Shields, Found DeadDennis Shields reportedly suffered a suspected overdose in his Trump Tower apartment. Bethenny Frankel Seeking Thick-skinned Assistant to Manage Her Dog’s ScheduleAs well as maintain her “upcoming wardrobe queue” and take cute pics of her with her pets. Bethenny for President?These days, a reality star who devotes her time to disaster relief inspires a surge of tweets calling for her to run for office. 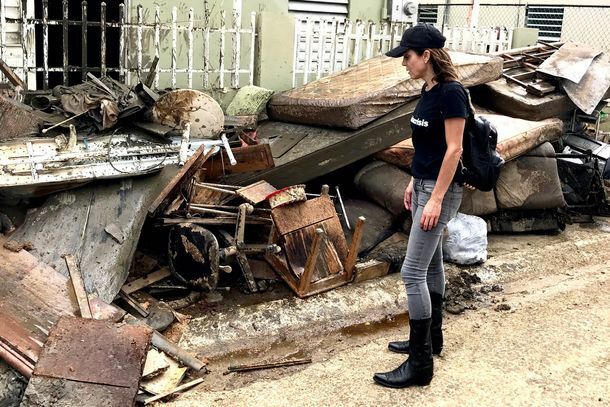 This Real Housewife Is on the Ground Providing Hurricane Relief in Puerto RicoThe Real Housewife chartered four planes to get supplies to Hurricane Maria victims. You Can Probably Guess Who Wasn’t Invited to Luann de Lesseps’s WeddingNext season of RHONY should be fun. Buy Bethenny Frankel’s Condo and Live Your RHONY TruthJust burn a lot of sage before you move in. A Terrifying Encounter With Bethenny Frankel at Us Weekly’s Style PartyAt Us Weekly’s Most Stylish New Yorkers party, I talked to every D-list celebrity on Earth. Bethenny on Why RH Is Like a ‘Natural Disaster’And why viewers can tell when the Housewives are inauthentic. Bethenny Frankel to Make Weed Super-LameSkinnygirl Marijuana: munchie-free and devoid of joy. See an Old Picture of Bethenny Frankel and ScreechBethenny and Screech? Now we’ve seen everything. Bethenny Frankel Used to Have a ‘Massive’ Crush on Jerry SeinfeldThe Housewife answers our 21 Questions. Benefit Movie; Lanvin’s Couture Fragrance Plus, Jennifer Lawrence wears red lipstick on the cover of Gioia magazine. Beckham’s Elle Cover; Frankel’s ‘Real’ CampaignPlus, Gia Coppola for DVF, Olivia Palermo’s trademarking spree, and more fashion news. Test Drive: How Skinny Will SkinnyGirl Products Actually Make You?See Bethenny Frankel’s creams and body glimmers transform an average woman’s body! Miss Piggy Gives Beauty Advice; a Guide to Bieber’s HairPlus, dermatologists have seen a rise in adult acne, and more beauty news. The Reality Stars’ Guide to BrandingBranding experts help us put together six rules for anyone wanting to build their own brand. Bethenny Frankel Expands Into Skinnygirl-Branded LoungewearBecause who wouldn’t want sweatpants to match her diet margarita? Bethenny Frankel’s Drink Is Doing to Your Body What Real Housewives Does to Your BrainDestroying it from the inside. Bethenny Ever After Renewed for Third SeasonAffluencers dig her. Bethenny Frankel Might Appear on More Than Six New Housewives EpisodesBravo. Johnny Weir to Host Skating With the StarsHe’ll judge Bethenny Frankel’s toe-loops. Bethenny Frankel, Sean Young Sign Up for Skating With the StarsVince Neil and Rebecca Budig have also volunteered to fall down a lot on national TV. Bethenny Says She’s Finished With Real HousewivesHer “gut” is telling her to jump ship. Why The Real Housewives of New York City Will Stink Without BethennyHow can you have a Greek tragedy without the chorus? Bethenny Frankel’s Wedding Planner Sees His Strong Resemblance to Buster BluthAnd he’s not really friends with Frankel. Jesus Luz Is Left Alone to Party in RioMadonna, meanwhile, is hard at work in London. Shiloh Jolie-Pitt Wants to Be a BoyAnd now Brad and Angelina have the most coveted minority child of all: the trans man. Is Bethenny Frankel the Villain of Bethenny Getting Married?Bethenny may not be “The Bethenny” of her own show. The Sarah Palin Reality Show Will Be the Anti–Real HousewivesWe’re sticking with Team Bethenny. That’s always been a safe bet.